Deep waves of burnt red. Oozing with unusual character and warmth, this golden walnut shade makes gorgeous company for luxurious interiors. Style with opulent purple, silver touches and striking black patterns to capture the glamorous feel of 1920s Art Deco style. 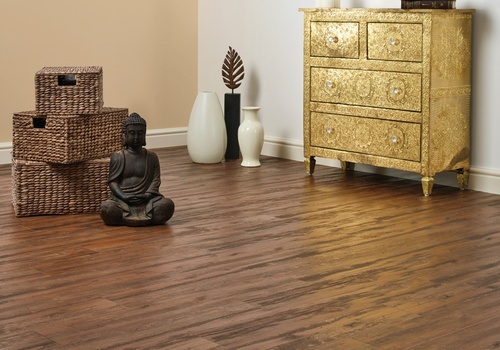 Characterised by the flowing grains of the European Walnut tree, this floor oozes unusual charisma. 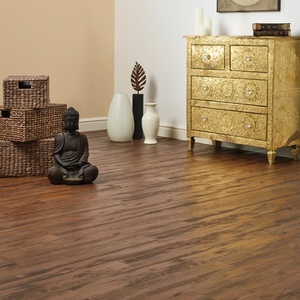 The dramatic grain details and warming tones of this golden walnut flooring design make gorgeous company for bold and majestic interior schemes. Style with rich purple, silver touches and striking black patterns to capture 1920s period glamour. 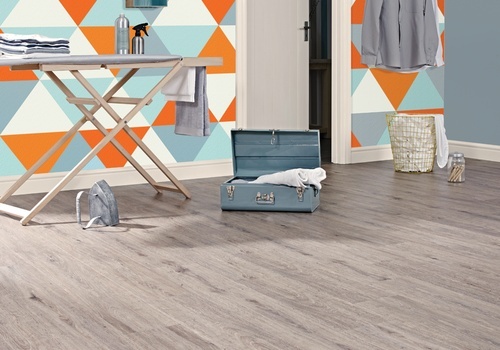 These planks are equipped with unique Vitesse technology meaning they can be fitted quickly, easily and completely adhesive-free with a magnetic underlay. 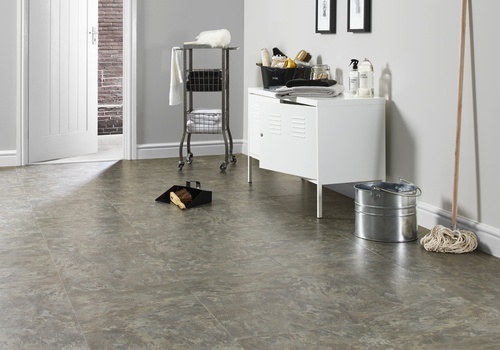 Get a closer look at this charming vinyl flooring design’s shades and textures by ordering a free sample. With rich auburn shades and powerful contrasts, Distressed Acacia brings a potent atmosphere to any room. 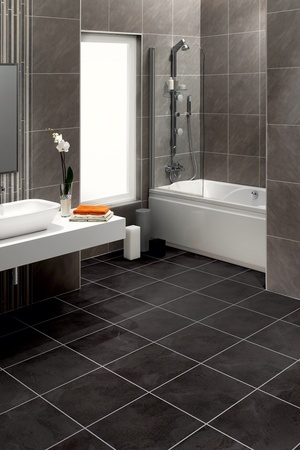 Enhance the moody feel and lift the floor’s colour with shades that border red. Coral-pink, orange and chestnut-brown can create depth in your room while ethnic patterns, floral bursts and unusual accessories add tinges of exotic spice. Cherry-red seeps through truffle shades in this effortlessly warm and welcoming design. 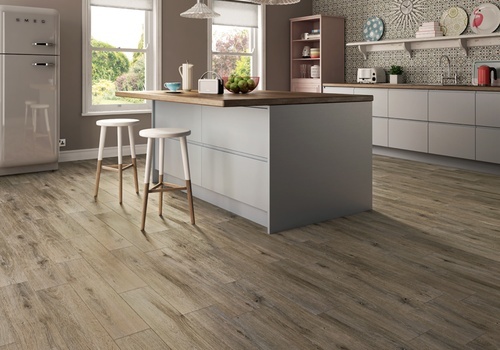 This Distressed Acacia flooring design combines deep shades with dramatic grain patterns for a statement effect that’s transformational in the home. Pair with rich colour schemes that feature coral pink, orange and violet to bring the floor’s subtle red tones into the limelight. 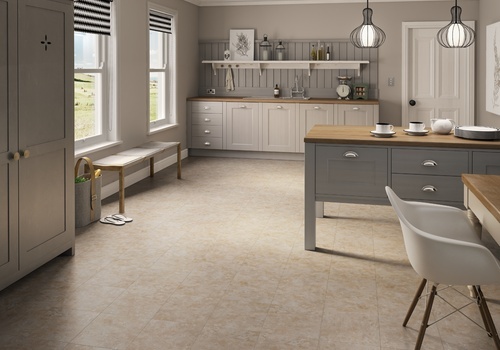 Get a closer look at Acacia’s arresting colours and authentic textures by ordering a free sample of this design vinyl flooring. 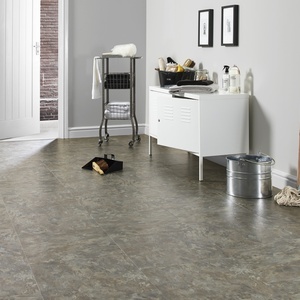 You can also view larger swatches and get expert help with creating your dream floor at your local stockist. Find your nearest here. 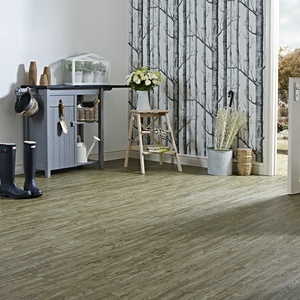 Bring the rustic drama of Weathered Larch into the limelight by stripping back the colours and style of your space. Muted shades of green can make the perfect subtle contrast while cream will highlight the lighter tones in the design. 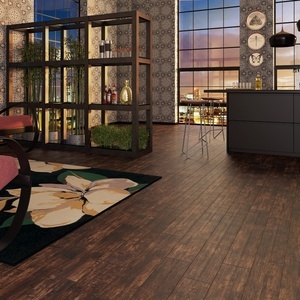 Further complement the floor’s raw feel with wood surfaces, metal furnishings and house plants. 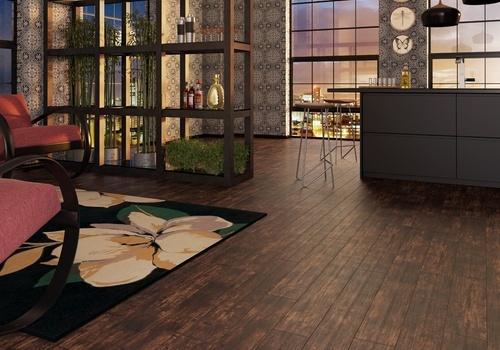 A statement rustic floor defined by rippling cocoa tones and bold grain character. 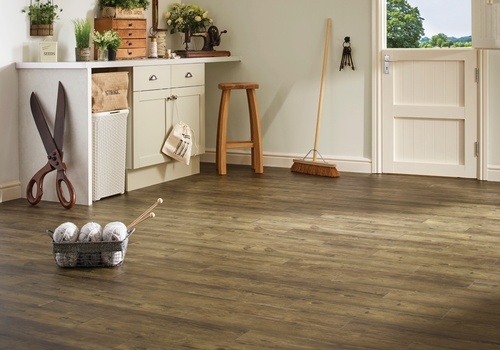 Weathered Larch combines light cocoa shades with rustic grain character to create the effect of a pre-loved and worn timber. 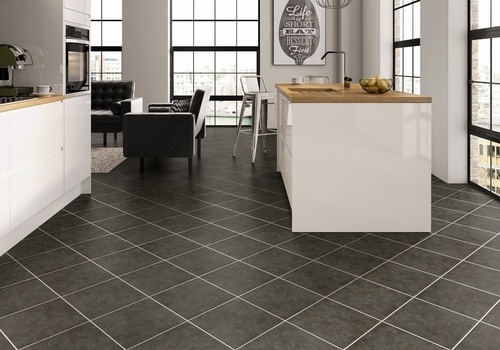 With a water-resistant coating and high level of durability, the design is perfect for kitchen flooring or any room in the home where a higher level of practicality is desired. 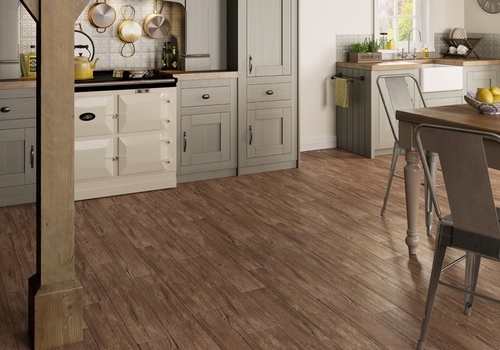 Order a free sample to get a closer look at this rustic vinyl flooring design or visit your nearest stockist to view larger swatches and get expert advice on creating your perfect floor. Find your nearest stockist here. 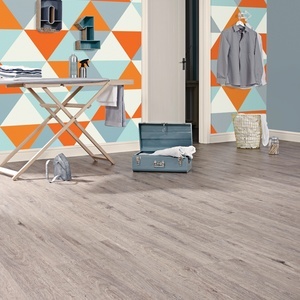 Abundant with the beauty of wood knots and grains, this ashen floor is perfect for pastel interiors. 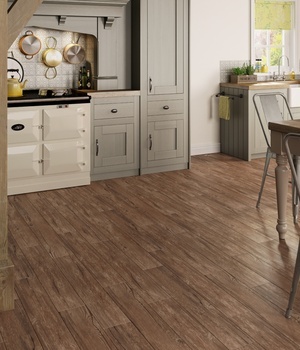 Muted pastels play-up the oak's grey tones while light woods and creams sit wonderfully with the design's cocoa accents. Accessorise with antique patterns and retro appliances to capture vintage zest in your room. 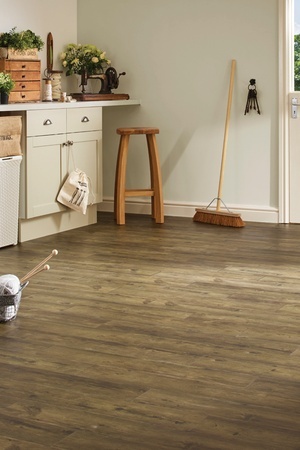 Detailed grains are washed with cool, ashen tones in this authentic treated-wood design. 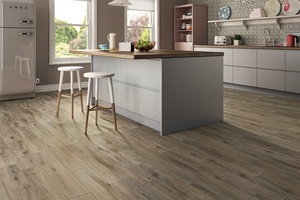 Limed Oak is a popular grey flooring design with an edgy mix of the traditional and contemporary. 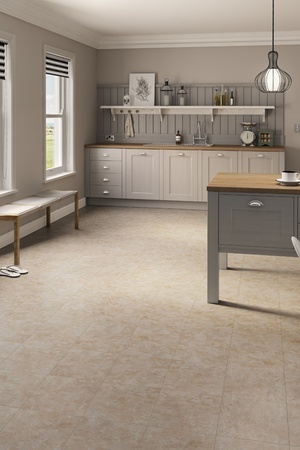 Each board is abundant with rustic timber character and washed in silvery tones for modern appeal. Such a subtle shade looks great with bright pop colours – especially yellow, orange and blue. 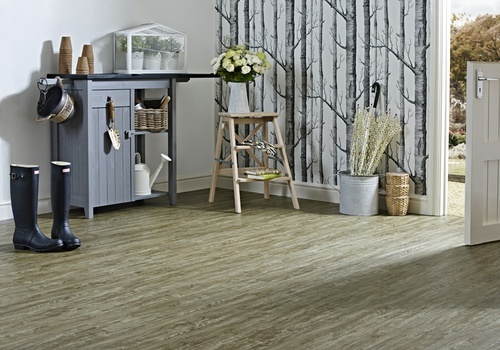 With unique Vitesse technology, Limed Oak can be fitted completely adhesive-free to a magnetic underlay for quick and easy installation. 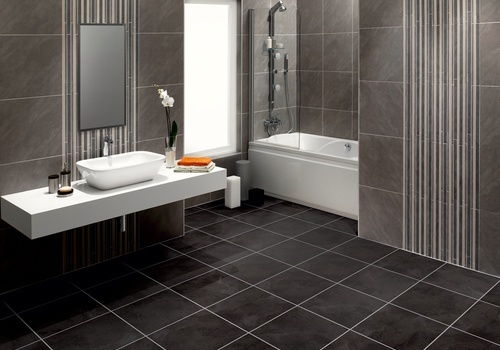 Get a closer look at this contemporary vinyl flooring design by ordering a free sample. 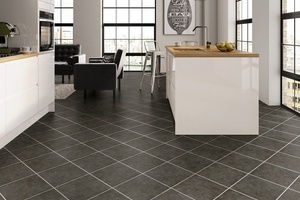 You can also view larger swatches of the floor at your local retailer. Find your nearest here.